A law firm website is its most important marketing tool, particularly for insurance defense or AmLaw 100-200 law firms that do not typically run online advertising campaigns. Once a prospect learns about your law firm, they often visit your attorney bio pages and practice area pages to learn more about your services. Recent Internet industry efforts to increase online security standards include the upgrade from “HTTP” to “HTTPS” protocols. You will recognize the “HTTP” as part of the URL path name for your website, such as http://www.lawfirm.com. Once you upgrade to the enhanced security level, your URL path name changes to https://www.lawfirm.com. HTTP is an acronym for “hypertext transfer protocol,” which has been in use since the early days of the Internet in 1994. The new HTTPS standard refers to “hypertext transfer protocol secure.” Data sent using HTTPS is secured via a “transport layer security” protocol (TLS), which replaces the previous “secure socket layer” SSL standard. HTTPS security protects data communications between your website and your visitor’s connection in three ways: encryption, data integrity, and authentication. It is designed to protect against “man in the middle” attacks. Banks, online retailers, healthcare providers, and other websites that manage sensitive payment or consumer transactions requiring enhanced levels of privacy and data integrity have been using the HTTPS standard for many years. Increased cybersecurity concerns are behind collaborative industry efforts, including support from Google, to further strengthen the Internet. The World Wide Web Consortium (W3C) is an international community that develops open standards to ensure the long-term growth of the Web. Beginning in July 2018 with the release of Chrome 68, Chrome is now marking all HTTP sites as “not secure.” Chrome is the Linux-based browser and operating system used by Google. See the image below to better understand how this is viewed on the Internet. Law firms can determine the security level for their own website by hovering over the URL name in the upper left corner of their home page. If you see a small image of a lock followed by HTTPS prior to your URL, then your site has been upgraded to the new security level. For those law firms that maintain an online advertising campaign using Google AdWords (now renamed Google Ads), Google now automatically redirects AdWords clicks to the HTTPS version of a URL. It is also recommended that all landing page URLs be updated in the Google campaign manager to reflect the HTTPS status. If your law firm website does not already utilize the HTTPS security standard, speak with your webmaster or web hosting service to discuss the upgrade. It can actually be fairly easy, depending on the complexity of your website, with the webmaster or hosting service taking the lead on the process. You will need to purchase a security certificate for your website, which is likely to cost approximately $200 per year per website. 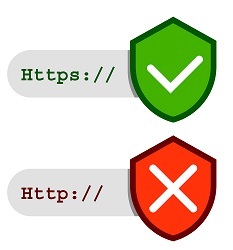 HTTPS guarantees the integrity of a connection between two systems (like your website and the visitor’s information). HTTPS does not protect the systems themselves and is not a replacement for protection against malware or cybersecurity attacks. While you upgrade your website security, you might want to also review all of your online data protection efforts. If your law firm is asking how you can get more clients, give us a call. We are a national legal marketing agency focused on business development in the defense sector. We have helped more than 150 insurance defense law firms pursue new clients. We make it our business to identify who your law firm needs to contact at insurance companies, Fortune 500 companies, and self-insured entities to be considered for a position as outside defense counsel.